A strategic communicator and animal lover who finds passion in creative writing, running and the great outdoors. I don’t consider myself an expert hiker, but like many others, I do like hiking from time to time since we live in such a beautiful province. I’ve thought about purchasing a pair of hiking boots in the past, but their prices turned me off, and I thought I wouldn’t make enough use of them to make it worth the price. So I would usually just settle for wearing my pair of old or current runners when I went hiking. 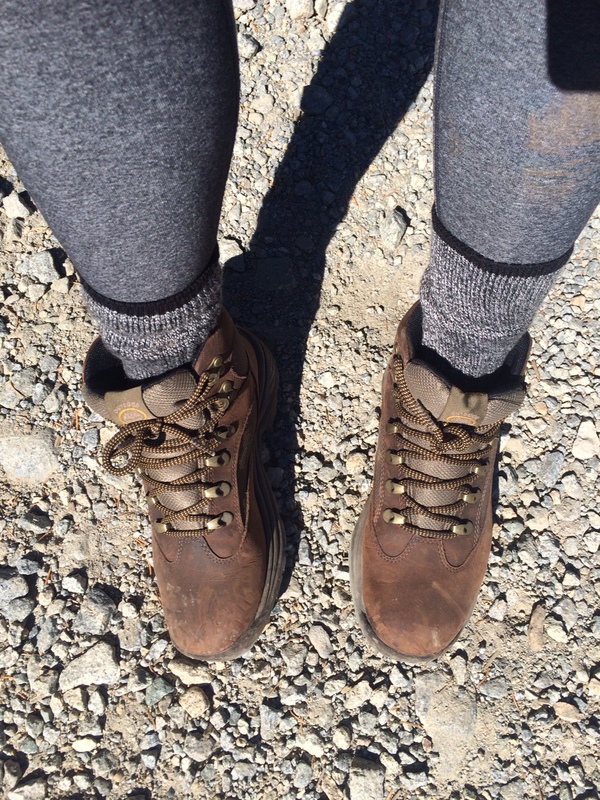 However, I recently had a change of heart and invested in my first pair of hiking boots, a decision I know I won’t regret, based on my enjoyable experience hiking in them over the weekend. Why did I give in and decide to purchase hiking boots in the first place? Since I run quite a bit, I realized the more I wore my runners on hikes, the faster they wore out (a no brainer! ), which meant I had to replace my runners more frequently. In addition to looking dirty and being worn out faster, runners or old shoes you have laying around aren’t the best on your feet and legs on some of the steeper hikes with slick rocks or slippery ground. Sure I could get by with them, but runners don’t provide me with the stability or comfort when hiking up a trail. 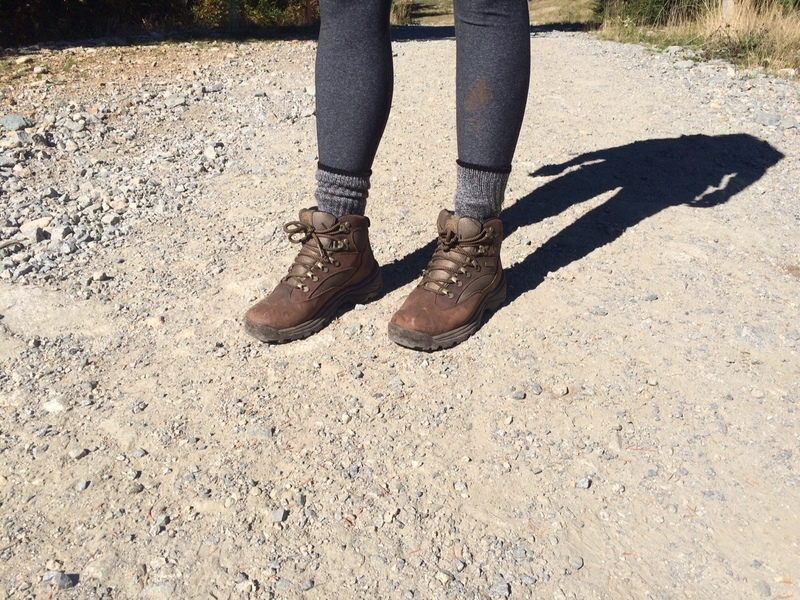 In hiking boots, I’m able to find my footing much easier and with more confidence because my boots are much sturdier than my Asics runners. Another reason I decided to get hikers is because I didn’t want to be more prone to injury by falling or twisting my ankle while hiking down a mountain or hill. 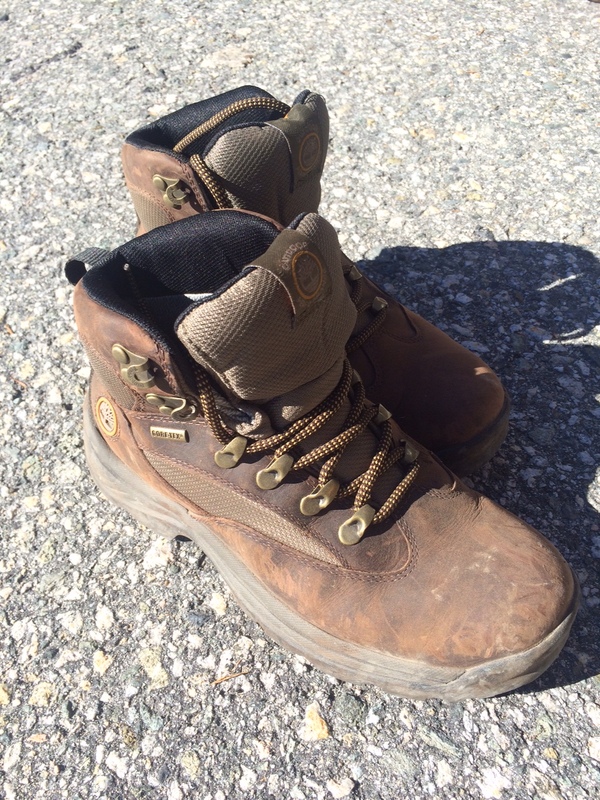 When I wore used to wear runners on a hike, my toes would always hit the top of my shoe when I was hiking downwards, which caused pain and discomfort, but I don’t have that issue anymore now that I wear hiking boots. And of course, it’s a good feeling to know I can walk through any mud or water puddle and still have dry feet! Contrary to popular belief (my own included), hiking boots don’t always have to be super expensive. 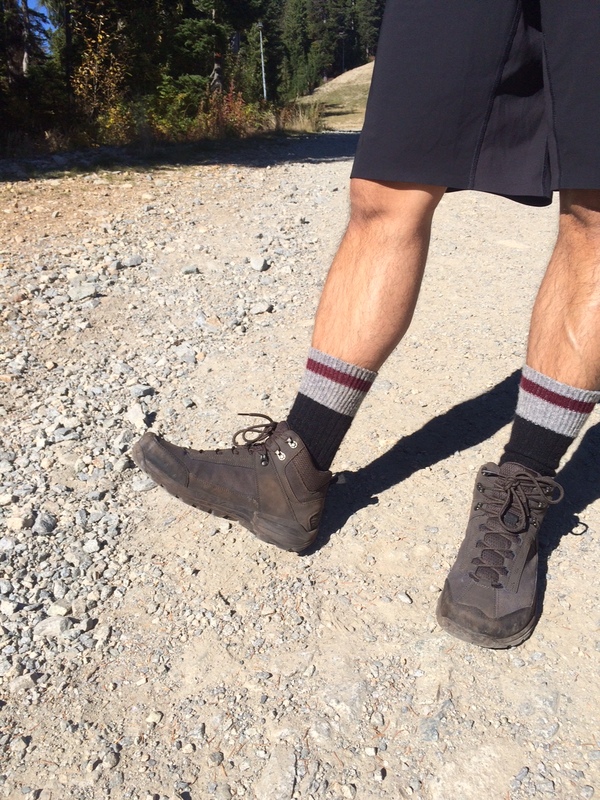 There are a couple of options worth looking into if you’re considering purchasing a pair of hikers. Of all places, I bought mine from Winners/Homesense, a store that I LOVE for outdoor gear because I’m always surprised how much good stuff they have! I bought a pair of Timberland hiking boots with a gortex exterior. They retail for $150CAD, but I bought them for $80CAD, which is a very good deal, but not a price that everyone can afford or wants to pay. If you do a bit of digging around the shoe section of Winners, you can find trail runners for around $50-$60CAD. Trail runners aren’t going to be as sturdy as hiking boots, and generally they don’t provide as much ankle support as them, but at least you’ll have more grip on the bottom of your shoes. 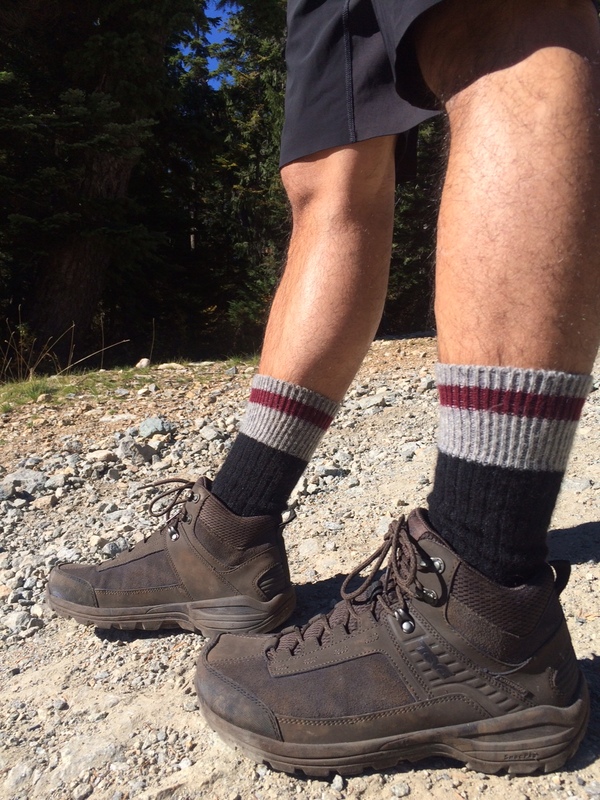 If you’re lucky like James, you can find a pair of hiking boots for $60CAD! His were TEVA, another recognized and well-known brand of hiking shoes and boots. Another place worth checking out for cheaper hiking boots is the Mountain Equipment Coop gear swap, something my sister recently told me about. You’ll have to go to their website and search for any upcoming gear swap events, where you can buy or sell used outdoor gear. The event allows users to recycle any used outdoor gear as long as it’s in a condition that’s still useable or wearable. Check out the MEC website for more info on this. My sister was able to get a pair of decent hikers at a gear swap for $30CAD. You can also check out Shoeme.ca, which carries branded shoes, but for slightly cheaper. It may not be for everyone, but I am very happy that I invested in a pair of hiking boots, because of the comfort and safety factor, and because I am not as hesitant or scared climbing up rocks, or steep hills. 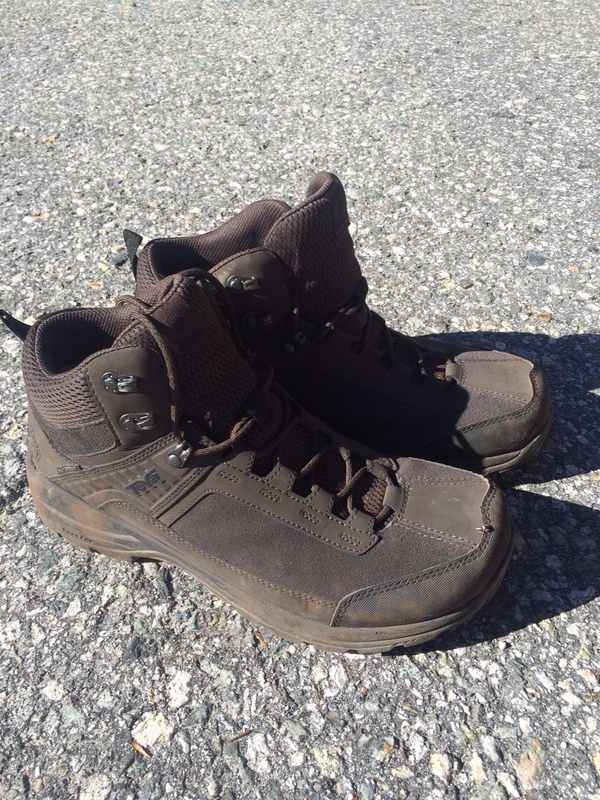 When these wear out (it will probably take a while), I will gladly replace them with another pair of hiking boots.